The astonishing ability to make English both incomprehensible and deadly. 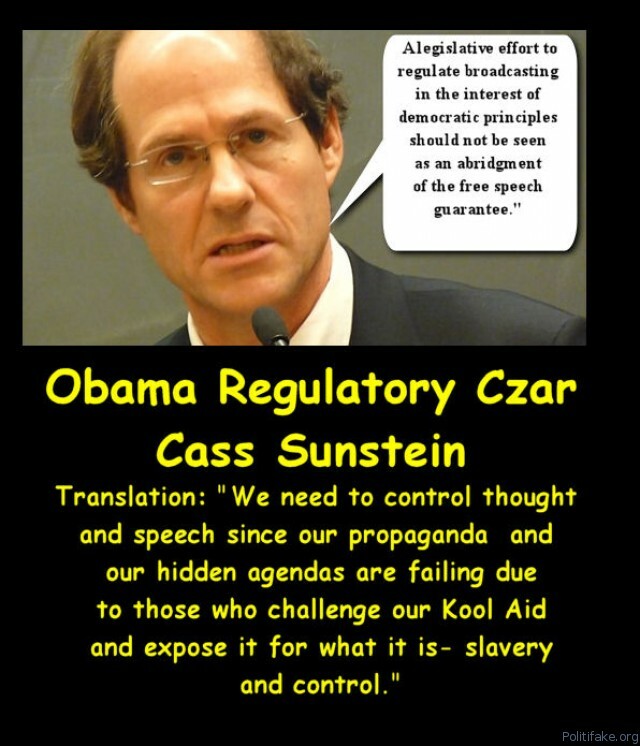 Few in Obama’s cadre of Master Planning Control Freaks project a more sinister aura than Cass Sunstein, fittingly appointed the administration’s Regulatory Czar (2009-2012). As Daniel Greenfield describes him, Sunstein is the poster boy for “Inside every liberal is a totalitarian screaming to get out.” Who better to rule over Federal Regulation? The egghead avatar of “Nudge Theory” (leaving the messy, necessary “Force” to the less cerebral members of the Planning Team), Sunstein’s “Choice Architecture” vision for us is a house designed by Orwell, interiors by Kafka. Take for example his creepily detached ruminations in a UN Report about the ignorant public’s refusal to see “Climate Change” (aka “The Weather”) as something to fear. To persuade stubborn “deniers” otherwise, Dr. FrankSunstein has his ways: “All the obstacles [to full embrace of Global Warming Gospel] are daunt­ing…the world is un­likely to make much pro­gress on cli­mate change un­til the bar­ri­er of hu­man psy­cho­logy is squarely ad­dressed.” Ah, human psychology, free will, individual choice: inconvenient barriers when one sees oneself as the Master Planner and the rest of humanity as specimens in a test tube. For a Cass Sunstein, it’s just a matter of applying the right “scientific” methods to attain the desired results. By force if necessary. Not surprisingly, Sunstein has chosen another all-knowing Master Planner as his fair lady: Samantha Power, currently Obama’s hand-picked, Israel-hating UN Ambassador. If the rest of us are mere children in their scheme to make the world in their own Progressive image, the mind reels at what notions of independent thought and creative activity these two Superior Beings have instilled in their own two children. Doubtless, the Perfect Family in their own warped minds, they are the implementers of our worst Orwellian nightmare: our thoughts, our tastes, our choices proscribed from on high, the jackboot a corrective measure if we “mistakenly” choose otherwise.